Mammoth. Larissa Andrusyshyn. Punchy Poetry. DC Books. Montreal, Quebec. 2010. 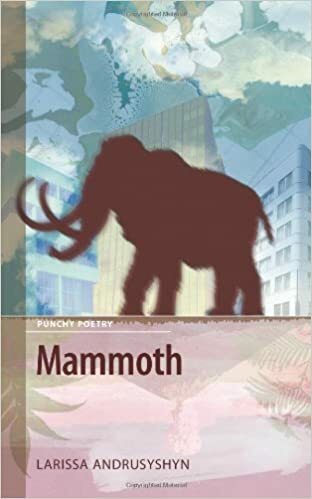 The first thing Today's book of poetry said in that review/blog was that we wanted to get our meaty little hands Andrusyshyn's first book, Mammoth. We did. It is startlingly good which comes as no surprise here. Andrusyshyn's one-two punch of Mammoth and Proof is a noteworthy accomplishment and one hell of an entrance to Canadian letters. Mammoth could be seen, in part, as a scientific report on genetics and the moody behaviour of those under a variety of microscopes. Andrusyshyn has the intricate eye of procedure that she apparently stole from some now blind scientist, she also has a streak of Darwinian glee in her anthropomorphous and delightfully necessary beasts repleat with human language and understanding. What she does more than anything else is to write poems of such self evident truthfulness and perception that the reader willingly accepts the reason of mammoths, the contemplative nature of polar bears, the tell-tale beating of a petri-dish laboratory heart. board a Cessna for the airport. for the bored customer of windowless diners. where he hides his camp from the parks department. and the grizzly bear knows this place. or hold up lenses to watch them with. calling them by their names. Today's book of poetry knows we shouldn't laugh at that story, so turn away for a moment because it makes us howl. Larissa Andrusyshyn happily employs the scientific worlds of biology, anthropology and numerous other ologys, Andrusyshyn renders them clever tools as she navigates those belief systems for us, translates so that the terrain makes our poetry hearts race. If Mammoth weren't so damned spot on emotionally you'd almost think someone as clever as Andrusyshyn was toying with us. Milo, our head tech, was tickled pink this morning when I foisted Mammoth on the staff for the morning read. "This is that Proof poet! Right!?" Milo could hardly contain his enthusiasm and it was infectious. This morning's reading was quick paced in a room full of smiles. Mammoth reads smart and clean, the poems give themselves to the reader with such self-evident precision and common sense that Today's book of poetry had to look behind the covers to see if it was a trick. Andrusyshyn impressed Today's book of poetry with Proof, Mammoth confirms it, this is a poet full of golden promise. and the flight details for your friends from Winnipeg. We visit you in shifts, in manageable numbers. cappuccino scum. The elbows of mediocrity. a recipe for bread. You stop and take breaths. You keep repeating "three cups of flaxseed flour." your voice is a blizzard, an operatic storm. and we hang like the troubled hands of murderers. Mammoth isn't all sunshine and blue sky. Andrusyshyn gives us a fair share of the certainty of death at the end of the ride - but her entertaining poems make it a more worthwhile journey. Two books in and Larissa Andrusyshyn has made a big fan out of Today's book of poetry.